and have its midi notes sequenced for looping. This is something I really want. Hoping in the future AUM can do this internally. As a workaround, it is very easy to just send the synth to Xequence and record the MIDI loops there. You don’t need to change your AUM session other than routing the MIDI to Xequence and adding the synth in the Xequence track. Well was thing effects slot since then the notes played from instrument would be recorded directly below it. Then if you want to chage the sound you simply adjust the instrument above it. A good work flow.....i think. Then again i know little but what i think i want and will try anything. I am not sure it has to be in the FX slot. It could run much in the same way as Rozeta does - with AU3 midi you should be able to route the midi out of the sequencer to any Synth in AUM and record into the sequencer using AU3 midi from any synth that supports it. @midiSequencer If it does what I hope it does - sold - take my money. Quantum as auv3 midi ? Need beta tester ? 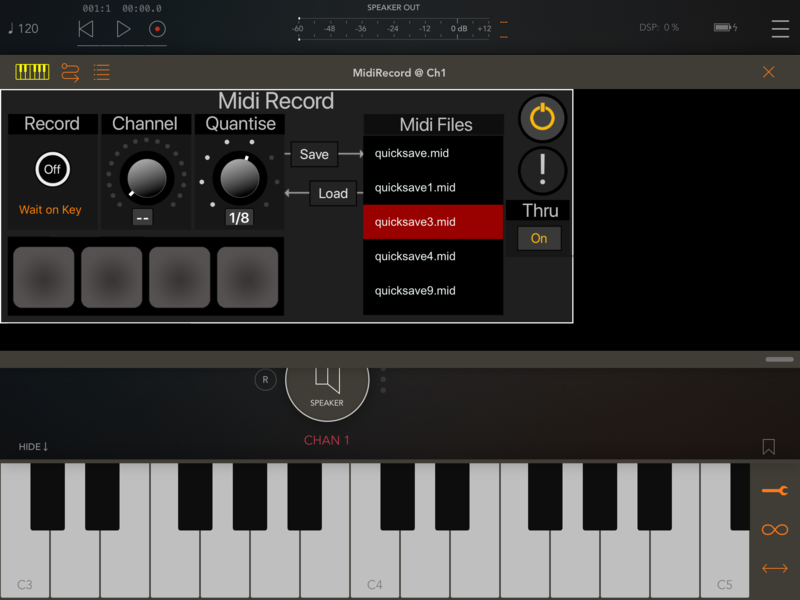 You can record midi (notes, ccs, sysex etc) - quantise it as you are recording, filter by channel into a buffer. You can trigger recording from first note or first midi message. Save it to the app documents folder as a .mid file (standard type 0). Share it using airplay to apps like Mail or Audioshare. Load it from the documents folder to the buffer. I then have some pads ready (just 4 for now, lit when populated) - you will be able to load tracks to these and trigger them (they play out of the AUv3 midi along with your input) - so you can use this as a looper (there will be some looping options). So basically this gives you the ability to record, playback & manage your recordings as midi files to share with other apps. I will be creating step/generative sequencers at some point but to put Quantum into auv3 is not easy due to the UI. This is the first time I've used Apple UIKit and I'm doing this in swift language too (Quantum is ObjC & c). I have some pads ready (just 4 for now, lit when populated) - you will be able to load tracks to these and trigger them (they play out of the AUv3 midi channel along with your input) - so you can use this as a looper (there will be some looping options). Can you get it to record midi in sync to host by bar length and have recorded midi play back and loop automatically in sync? Can you get it to record in sync to host by bar length and have recording play back automatically in sync? Playback in sync (Link or host) is essential. I've not sync'd the record bit yet (its triggered by midi in the input) but yes I have access to the link beat or sample as this is supplied by the host - so I think this is easy to offer. Also looking to include bpm changes as well - as the host tells me that too. Yes please 🤤 could you add an audio cue? Metronome if possible? Visual cue is cool too. Can the visual clue be made so it tells you where the link phases are? @midiSequencer oh wow. If this integrates with AUMs transport/record controls so you can record audio (to AUM) and midi loops at the same time this will be wonderful! Looks fab looking forward to this one. yes - playback via the pads - you will be able to set some parameters (transpose, loop times etc). and auto playback option when you limit the record (spinning plate analogy). thx @brambos - I'm still waiting to hit that technical challenge (other than Apple's quirky UI that is) but I've been testing my midi files against MuseScore etc to make sure the midi is standard (& therefore shareable). Quantum does this. I'm not sure if host (like AUM or AB) displays the Link timeline or its own - will need to check, but I can reuse the code I have to get Link beat. I've not added Link yet - most other auv3 midi apps don't seem to present the normal Link pop-up - not sure why but I intend to. My saturday has gotten a whole lot better! button pushing, sound shaping, rhythm building, freaks.